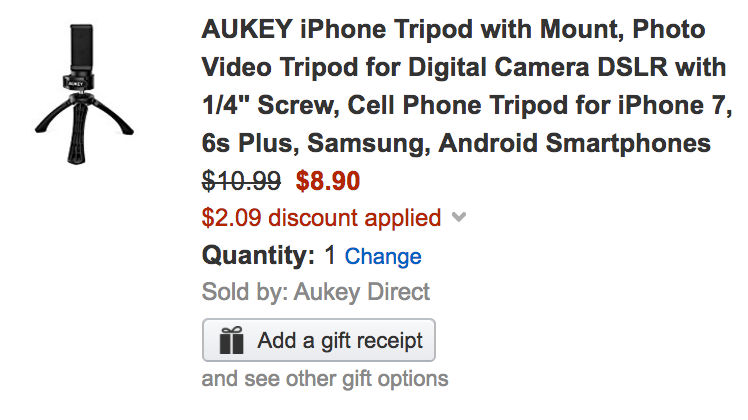 AUKEY via Amazon offers its iPhone Tripod with Phone Mount for $10.99, but if you use the code AMOUNT88 the price drops to just $8.90 Prime shipped. That’s $2 off the regular price and the lowest we’ve seen for it at Amazon. This tripod lets you take clearer shots from a stable position. It’ll work with smartphones up to 5.7-inches with included holder, or attach digital cameras, GoPros, camcorder, and more. Rated 4.6/5 stars by 60 Amazon shoppers. The CP-T01 is a lightweight mini tripod with a built-in wrist strap that’s perfect to bring along on any adventure. Find the right angle with the 360° rotatable ball head. Take stunning shots or videos from a stable, versatile mini tripod. Besides, the cellphone mount holds your phone horizontally and vertically with two internal screw threads on the phone mount. How to Use 1. Take off the cap and screw on the phone mount; 2. Put your cellphones on the phone mount; 3. Using the thumb screw with AUKEY logo to tighten the ball joint and keep your phone in position; 4. Or if you want to mount a camera, just screw it on the tripod through the 1/4″ standard screw; 5. Enjoy your shooting or video time!